Hey guys, Trainer Kami here! I’m the head trainer here at IdealShape and I’ve got some exciting news for you! But first, did you know that most adults have major nutritional gaps in their diet? This means we often don’t get the crucial vitamins and minerals our body needs to function (and lose weight!) optimally. When we are trying to lose weight, these vitamin and mineral deficiencies can be even more prominent due to reduced calorie intake. Current research suggests that by filling in these nutritional gaps, your body gets the vitamins and minerals that not only aid in optimal health, but also help support optimal appetite control. If any of you have tried to lose weight before, you already know that hunger and cravings are THE biggest roadblocks when it comes to reaching your goal weight. That’s why I teamed up with IdealShape to create a multivitamin that solves this problem of missing nutrients in the diet, which hinders weight loss. We created IdealVitamin so you can be sure you’re getting the essential vitamins and minerals your body needs to thrive so the weight can come off easier. IdealVitamin is a complete daily multivitamin supplement with 20 vitamins and minerals PLUS an antioxidant complex and superfood extracts to keep us at our best. You’ll also get a robust serving of B vitamins which are crucial for turning food into fuel in the body. This means the food you eat will more likely be burned as energy rather than stored as fat! Get IdealVitamin today and give your body the nutrients it needs to be healthy and drop those unwanted pounds! In a perfect world, all of us would eat perfectly. We would all get our 9 servings of fruits and veggies each day, indulge in superfoods, and get all the nutrition we needed right from our food. Unfortunately, that perfect world doesn’t exist. We don’t always eat enough fruits, veggies, and superfoods, and it’s impossible for anyone to eat 100% perfect all the time. That’s where a multivitamin comes in and picks up the slack. If any essential vitamins or nutrients go missing in our diet (and they do! ), a high quality multivitamin takes care of those gaps. Getting the proper vitamins your body needs definitely has it’s benefits including healthy aging, heart health, and it supports the immune system and beautiful skin and hair. If you want to look and feel better than ever, you need a vitamin that supports your body's nutrient needs! 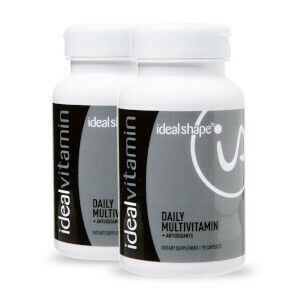 I worked with IdealShape to create a multivitamin that’s miles ahead the rest. Superfood Extracts — With ingredients like cranberry extract, resveratrol, lycopene, and lutein, you’ll support the body’s natural response to stress so weight loss won’t slow down or stall. An Antioxidant Complex — We included CoQ10 and Alpha Lipoic Acid for premium antioxidant benefits. Antioxidants protect the body from cellular damage. 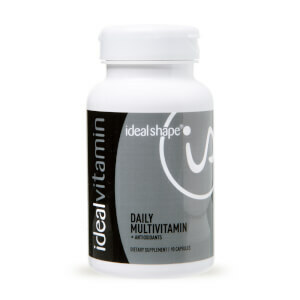 You don’t usually get these powerful antioxidants in a multivitamin, but at IdealShape we like to give you the best! B Vitamins — These guys are critical for turning food into fuel in the body and for maintaining energy levels. That’s why we were sure to include a sufficient amount of the most important B vitamins, so you can convert that food into energy, not fat! It can be a real challenge to get all the vitamins and minerals your body needs from whole foods. That’s where IdealVitamin comes in and makes up for anything missing. IdealVitamin gives you over 20 different vitamins, minerals, and other nutrients to help your body function optimally. We are bombarded by stressors each and every day. Antioxidants can reduce the negative impact of oxidative stress so we look and feel our best. We understand that consistent energy levels are huge when it comes to weight loss and just being productive! We included ingredients like CoQ10 and B vitamins so your body can better turn food into fuel. Support your weight loss and give your body the nutrients it needs. There’s no better time than now! We took it upon ourselves to create the best tasting and most effective meal replacement shake out there. We are raising the bar again to bring you the best multivitamin supplement that’s a step above the rest. 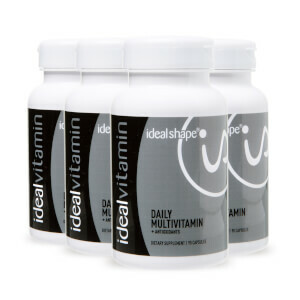 Reach your ideal and support your body with IdealVitamin!